At East Side Arts Alliance. 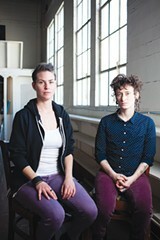 Carla Wojczuk (L) and Erin McElroy of the Anti-Eviciton Mapping Project. Dan Savage: Is it Legal to Bre… Caught At Ashby Stage.